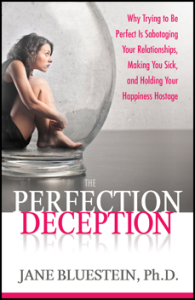 Why trying to be perfect is sabotaging your relationships, making you sick, and holding your happiness hostage. Note: This page is available for newsletter subscribers, site visitors, and social media friends and followers. While I can’t compete with Amazon on price, I can promise that your order will be signed and sent with love. Thanks! What’s wrong with perfectionism? Everything! Most people mistakenly confuse perfectionism with a healthy striving for excellence—but there is a big difference. One can lead to great achievement—or at least great learning—by allowing us to take risks, make mistakes, and forge ahead anyway. The other is a psychological wound that invites constant comparison with others, and traps us with all-or-nothing thinking that can paralyze us in a cycle of indecision, fear, and self-loathing. • explain how perfectionism grows from a desire to create feelings of safety, belonging and worth—if we are “perfect” no one will criticize, hurt, or reject us. • exposes perfectionism as the inner critic that screams “failure” or “fraud,” regardless of our efforts, progress, or success. • shows how perfectionism is an unattainable pursuit that systematically shuts out other people and pleasures. • identifies how perfectionism prevents us from saying “no” to others’ demands and makes us “too busy” to pursue our own dreams and goals. 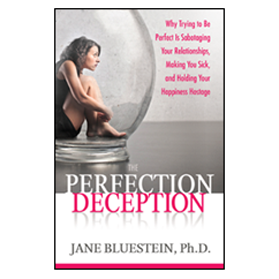 Over the years, Dr. Bluestein has seen the toxic and corrosive effects of perfectionism on people’s thinking, their bodies, their relationships, their work, and their sense of worth. She emphatically shows that perfectionism is not a good thing and it’s not remotely the same as doing your best. Through personal interviews and the latest research, Dr. Bluestein explores how our culture fuels the dysfunction, how perfectionism develops, and how it can hurt our physical, mental, and social well-being. Further, she provides practical strategies for moving toward authenticity and wholeness to live with confidence, self-fulfillment, and happiness. 5 1/2″ x 8 1/2″, 300 pages. $12.95. Special pre-order price available for site visitors, newsletter subscribers, and social media friends and followers. This book will be shipped via Media Mail in the U.S. For expedited (priority) shipping or shipping to Canada, please click the link below. 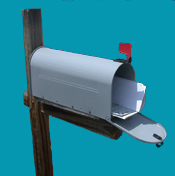 Priority mail shipping in U.S.
Add $6.00 to cover our cost of shipping the book via priority mail. International shipping for each book to be sent outside the U.S.
Interview questions and brief answers. Congratulations! Can’t wait to read the new book! Hope you’re well and above all happy each and every day! This last surgery of right hip replacement has truly given me a new lease on life! After a couple mini-vacations, we’re clearing out clutter and getting set up to write…both of us!